In what can be called the biggest property buying extravaganza, India’s largest PropTech player, Square Yards will be helping potential home buyers in 16 cities chose their dream home this Independence Day by offering them slashed prices, astonishingly low booking amounts and extremely simplified payment plans on a wide range of properties. In what can be called the biggest property buying extravaganza, India’s largest PropTech player, Square Yards will be helping potential home buyers in 16 cities chose their dream home this Independence Day by offering them slashed prices, astonishingly low booking amounts and extremely simplified payment plans on a wide range of properties. 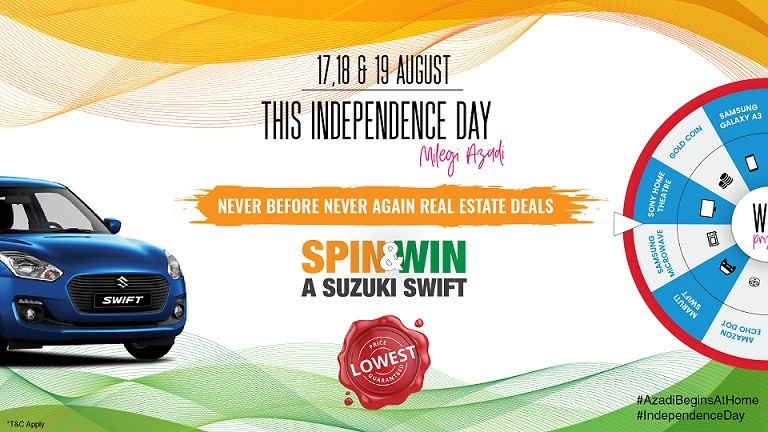 Potential buyers can hop on Square Yards Azadi Tour on 17th-19th August and get access to best developers, once in lifetime offers, chance to win cars and ability to get their mortgages sanctioned on the spot. The 16 cities covered under the Square Yards Azadi Tour are Noida, Gurugram, Mumbai, Pune, Kolkata, Lucknow, Bengaluru, Hyderabad, Vizag, Jaipur, Singapore, Dubai, Abu Dhabi, Qatar, Kuwait and Oman. The Square Yards Azadi Tour will start at 10 am on 17th August and end at 10 pm on 19th August in Singapore and the Indian cities. Only RERA registered projects will be on offer at Square Yards Azadi Tour, which will further offer peace of mind to buyers from regulatory and transparency perspective. Just to note, Square Yards has the largest RERA compliant network in India. The bouquet of products will be available from well-known developers such as Godrej Properties, Shapoorji Palonji Group, Brigade, Merlin, Gaur, Prestige, Alphathum, Omkar, Kanakia, Emaar, M3M and many more. "The exciting offers will be available only at the venue and will be available first come first serve. Square Yards Azadi Tour will offer guaranteed lowest prices of the participating properties, whether newly launched ones or ready to move in properties. If lower prices are discovered by anyone elsewhere, those prices are guaranteed to be matched at Square Yards Azadi Tour," said Mr. Tanuj Shori, CEO, Square Yards. According to Tanuj, roughly 2lac potential buyers have already expressed interest in accessing these offers and Square Yards expects to move USD 100 mn worth of home sales across 3 days. Square Yards has come up with two hashtags- #BecauseAzadiBeginsAtHome and #IndependenceDay so that buyers can find more details and buzz about the participating projects. On offer will be affordable properties as well as luxury projects. The participating projects have been chosen on the basis of connectivity, features, security for residents and a plethora of other aspects. Only reputed developers which have an enviable track record of on-time delivery have been chosen for the Square Yards Azadi Tour. An added attraction at the venue will be the lucky wheel which people can spin and can win a Maruti Swift car. Square Yards is a technology-enabled O2O transaction and aggregator platform for Global real estate. It offers a comprehensive, integrated menu of global property & asset portfolio by using technology, data, research and diversified presence to make global real estate investments decision making more research led and driven by risk/reward perspective. Square Yards has achieved a significant scale in facilitating real estate investments worth more than USD $2 Billion to 22500+ satisfied customers worldwide through its direct presence of more than 2000 employees in 40 cities in 9 countries including Australia, Canada, Hong Kong, India, Oman, Qatar, Singapore, UAE and UK. The event is being organized by 'Bling Events'. Bling Events is one of Asia’s largest real estate focused events company. As event management arm of the Square Yards Group, it specializes in niche and luxury events. Bling Events’ reach spans cities like Hong Kong, Singapore, Dubai, Abu Dhabi, London and many major Indian cities. Some of its flagship events like Indian Realty Revelry (IRR) and Global Property Road Show (GPRS) have gone on to become prominent fixtures in the event calendars of investors.